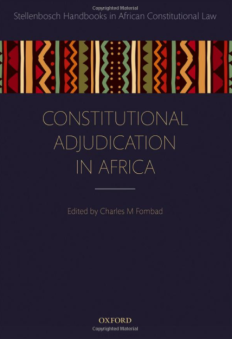 Professor Charles M Fombad talks to us about the recently published edited collection Constitutional Adjudication in Africa (Oxford University Press, 2017). Charles M Fombad is a Professor of Law at the University of Pretoria. Since the 1990 wave of constitutional reforms in Africa, the role of constitutional courts or courts exercising their power to interpret and apply constitutions has become a critical aspect to the on-going process of constitutional construction, reconstruction, and maintenance. These developments appear, at least from the texts of the revised or new constitutions, to have resulted in fundamental changes in the nature and role of courts exercising jurisdiction in constitutional matters. The chapters in this second volume of the Stellenbosch Handbooks in African Constitutional Law series are the first to undertake a critical and comparative examination of the interplay of the diverse forms of constitutional review models on the continent. Comparative analysis is particularly important given the fact that over the last two decades, constitutional courts in Africa have been asked to decide a litany of hotly-contested and often sensitive disputes of a social, political, and economic nature. As the list of areas in which these courts have intervened has grown, so too have their powers, actual or potential. By identifying and examining the different models of constitutional review adopted, these chapters consider the extent to which these courts are contributing to enhancing constitutionalism and respect for the rule of law on the continent. The chapters show how the long-standing negative image of African courts is slowly changing. The courts have in responded in different ways to the variety of constraints, incentives, and opportunities that have been provided by the constitutional reforms of the last two decades to act as the bulwark against authoritarianism, and this provides a rich field for analysis, filling an important gap in the literature of contemporary comparative constitutional adjudication. This book is the second volume in a new series, the Stellenbosch Handbooks in African Constitutional Law, which is specifically designed to fill a gap in scholarship on African comparative constitutional law. The series was motivated by recognition of the fact that, although comparative constitutional law has now emerged strongly in the last two decades as a major field of legal scholarship, most of the extensive research and publications that have been carried out have focused mainly on the well-established democracies. The only African country that has occasionally attracted some research interest from a comparative law perspective is South Africa. The few books that do present some perspectives on African comparative constitutional law focus narrowly and exclusively on developments on either Anglophone, Francophone, or Arabophone Africa but with nothing cutting across these divides. The overriding objective of these series of books is therefore to bring together high quality innovative and original material from diverse perspectives written by scholars and legal practitioners drawn from the different constitutional traditions operating on the continent. As a volume that tried to bring together the different models of constitutional adjudication on the continent, all the authors had to draw from the scholarship of renowned authors who have written on the different models of constitutional review that have influenced developments in their countries. Nevertheless, in most cases, but for a few exceptions, the authors were researching and writing on a topic on which little had previously been written. Identifying and bringing together scholars from Anglophone, Arabophone, Francophone, Hispanophone, and Lusophone Africa who understand and share the vision of the whole project and are able to meet the high standards of Oxford University Press has been a major challenge. It is also not often easy to reconcile the different styles of writing. My hope is that this book and the Stellenbosch Handbooks in African Constitutional Law series as a whole, will not only stimulate interest in comparative constitutional law research and studies on the different constitutional traditions operating in Africa but also point directions for future research. It should also serve as a rich source of authoritative information for promoting an intra-African legal dialogue and the cross-fertilization of ideas across the different constitutional traditions. Furthermore, the books in the series are intended to act as a repository for the accumulation of knowledge, experience, and expertise on the continent. My hope is to bring comparative African constitutional law scholarship to the global stage. The next book in the series will deal with decentralisation and constitutionalism in Africa. It will examine the extent to which decentralisation, which has almost become the buzzword since the 1990s, is playing a role in promoting constitutionalism, democracy and respect for the rule of law and the challenges that it is facing.